five + = twelve Required Please enter the correct value. As of Friday, the U.S. Commodity Futures Trading Commission (CFTC) reported that silver speculators added further to their short positions, which no doubt kept a lid on the current price of silver. But the ceiling for mounting short positions is fast approaching as these positions escalate. As of last Tuesday, speculators had staked out 31,632 short positions on silver through short contracts – paper bets on future price declines – with an underlying 158.2 million ounces of the physical metal. On the year, this is the 12th largest volume of short contracts taken out for silver, and it's building ever closer to this year's previous highs. Not surprisingly, this buildup of short action has had a depressing effect on the silver price. It is now below its 2013 closing price of $19.565 an ounce, trading as low as $19.17 in the early morning today (Tuesday). The silver futures market and speculator activity has been a highly telling indicator for the future of silver price movements. When speculators begin buying up short positions in droves, the price of silver enters a bear session where declines become routine. But when silver speculation hits its peak and prices dive down to new lows, the speculators will begin to liquidate their short contracts and buy long. Two good examples of this recurring cycle happened just this year. 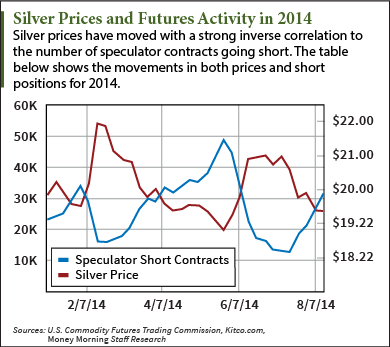 For the first month of 2014, speculators added to their short positions each week, growing that figure from 116 million ounces of physical silver underlying 23,206 contracts to 33,993 short contracts backed by 170 million ounces. In that period, silver price activity was effectively subdued, as prices dropped about $0.34 to $19.51, lower than the trading price of the white metal at the year's open.